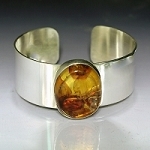 Our amber is from the region of the Baltic Sea. The colors include light yellow, orange, red, and dark brown. Plant material and insects can be visible in the amber. so it is best to avoid ultrasonics and simply clean the amber by wiping gently with a moist cloth .